Although I’m more likely to write about the stars, I’m also interested in the undersea frontier, which can seem even more alien. I follow the real-time video feeds from Nautilus Live as the drone submarine explores the ocean deep. 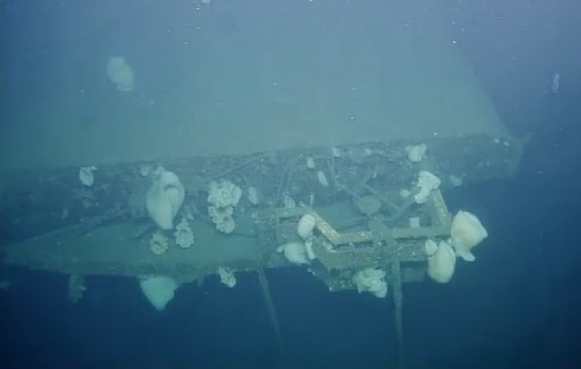 Today, the E/V Nautilus explored the USS Independence (CVL-22), a World War II era aircraft carrier, once used in the atomic tests at Bikini Atoll in the Pacific. Independence was scuttled in 1951. 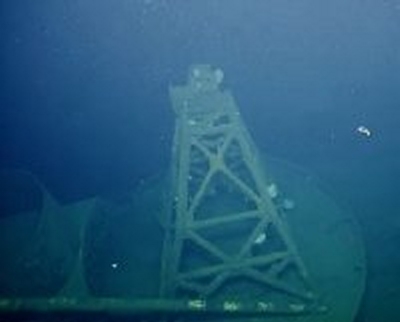 The ship was only 550 yards from the explosion. The Independence was one of 90 ships anchored at Bikini Atoll to test the effect of an atomic blast on warships. The blast destroyed Independence as a fleet-capable ship. It was then towed back to San Francisco to experiment with decontamination techniques to be used in case of an atomic war. In 1951, it was scuttled to prevent espionage. 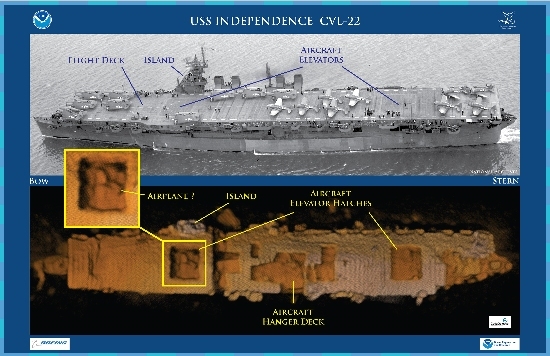 On August 22, 2016, Dr. Robert Ballard, and the crew of the E/V Nautilus conducted the first visual survey the USS Independence. Here are some of the images from that survey. (Above) This blast gauge tower, also called a “Christmas tree”, originally held part of a 40 mm anti-aircraft gun. When the gun was removed before the Bikini Atoll explosions, a gauge (still visible) was put atop the tree to measure the pressure of the atomic explosion. The flat area at the top of this picture is the leading edge of the flight deck. 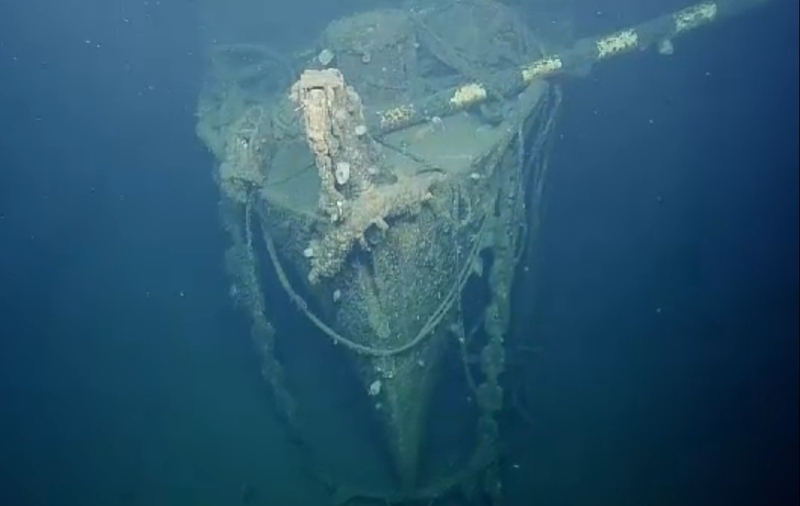 Hanging from its side is a 40 mm gun emplacement, now encrusted with sponges. This gun, a 20 mm anti-aircraft weapon, is still intact. Here is the bow of the Independence. Although most paint, including the ship’s name and number have corroded away, the broken pole angling off the right still shows some of its original color. 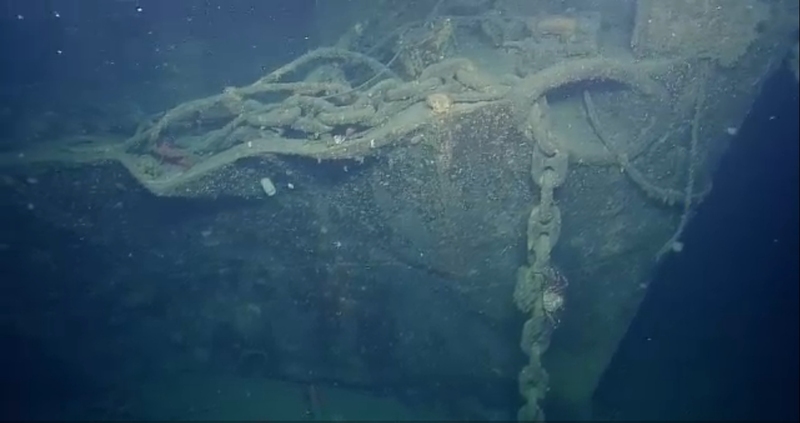 A closeup of the bow, showing the anchor chains. Interested? 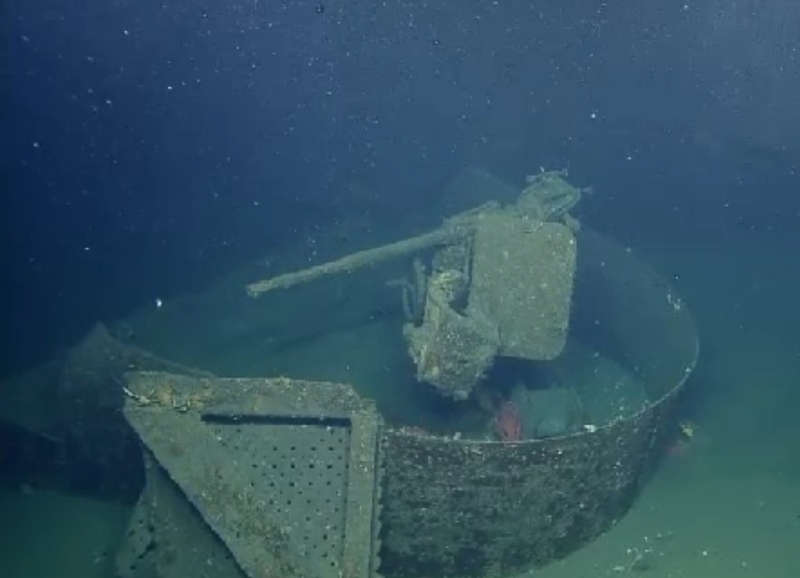 Visit Nautilus Live for more great visits.